Sanford's second Thursday of every month Alive After 5 street party in November was themed "Souper Sanford" and featured a soup contest. Entrants in two categories, Home Cook and Restaurant, each made about 5 gallons of soup. For the price of a $7 spoon and card, AA5 attendees were able to sample some or all of teh 15 soups and vote on their favorites. Every month on the second Thursday, historic Sanford's First Street is blocked off from Oak Street to Sanford Avenue and merchants and vendors set up along the street for Central Florida's largest and best monthly street party. Some vendors hand out food samples, some trinkets and promotional material, some offer mini-massages. Often there's a bounce house for kids. The event is kid and dog friendly. There are usually several music venues. And of course, a beer tent. Thousands of knowing area residents gather from 5-8 PM and party in the streets. 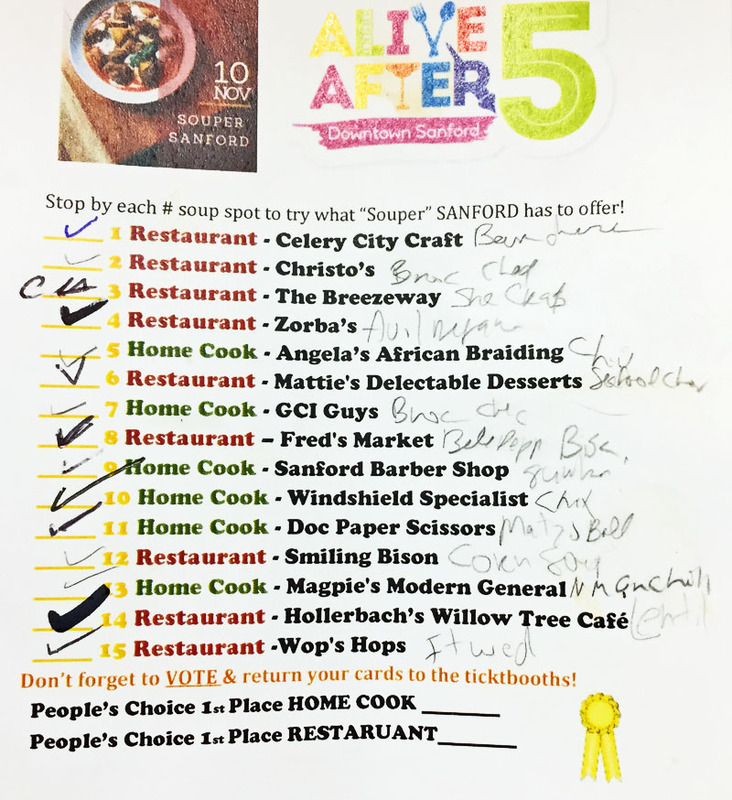 Each month has a theme, and in November it's Souper Sanford. At the end of the night, the votes were tabulated and winners announced. Before I write about my favorites--and I had some--a few general comments. First of all, in general, the competition this year was certainly stepped up. Last year there were a few soups that were just not good, this year, they were all good, some better than others, but none of them lacked seasoning. Second, I'd recommend that for next year the organizers and vendors consider using 1-ounce ladles. 15 soups at 1 ounce apiece is rather more than i can eat, and some gave out closer to 2 ounce portions. I think a one ounce portion is enough and would also level the playing field a bit. Now for my favorites in each category. My vote went for the first in each, but it was a hard decision, there were a number of great choices in each category. Lentil Soup from Hollerbach's Willow Tree Cafe was a close runner up. Hollerbach's has been making wonderful soups for a long time, and they do not skimp on the ingredients. You can tell this was homemade, nothing from a can or bottle. She-crab soup from The Breezeway, last year's winner, was also pretty gosh darned good. New Mexican Chili Chicken soup by Magpie's Modern General was far and above my first choice, in large part due to the carefully roasted chili flavor--it did not overpower the soup, was not overly spicy and in my mind was actually the best of all the soups I sampled, and even more so because it was by a home cool. Outstanding and definitely restaurant-quality in my mind. Mazto Ball soup from Doc Paper Scissors was also excellent. The chicken broth made this soup a real standout, it tasted fresh and homemade to me. And the addition of the matzo ball was perfect. The Gumbo by the Sanford Barber Shop was also a standout in my mind, in part because it seemed very authentic and contained all the flavors I'd expect in a good gumbo without being overly spicy. They did a nice job as well. Home Cook: Magpie's Modern General's New Mexican Chili Chicken soup. Restaurant: Fred's Market's Bell Pepper Rice soup. But again, I have to admin that the competition this year was really stepped up a few notches. There were not soups that I did not enjoy, and I'd have eaten a bowl of any one of them for my dinner. I did sample all 15 and was stuffed at the end of the night. Alive After 5 is one of my favorite monthly events in Sanford and I rarely miss it, every month on the second Thursday of the month, 5-8 PM. By the way, here is my ballot, before I marked my winners and turned it in. Yes, i tried all 15!